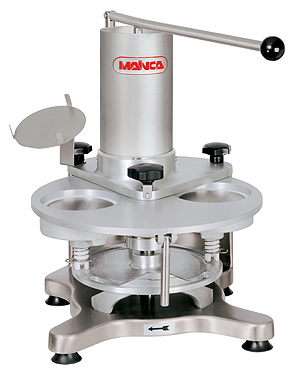 MAINCA - Burger / Meatball formers for the meat industry. Easy-to-handle fully manual burger machines. This is the solution between manual and automatic production. Ideal for small productions with different tastes and/or sizes. When conversant with the machine one can achieve an output of 250/300 burgers per hour. Manual production time is reduced and the same weight is maintained in all units. 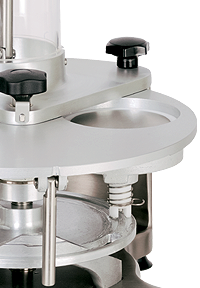 The thickness of the burger or meatball/croquettes is easily adjustable up to 40 mm in height. Different diameters of burgers and meatballs are available. Simply change the rotary mould plate. All plates are interchangeable. They are fully detachable without the use of tools for easy cleaning. A paper dispenser is included. They comply with EC regulations. Specific INT models comply with NSF / ANSI 169 American health certification.